Valentine’s Day is coming up and that means everyone is on the look out for special treats. I like to make special things for my family. It is a great way to show them that I love them. 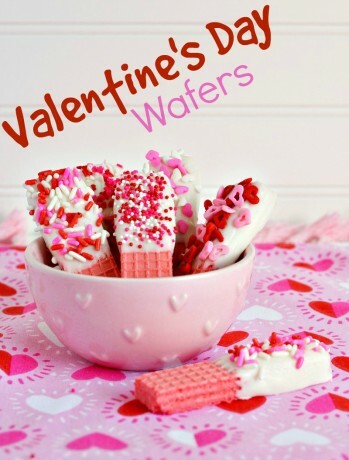 But being a homeschooling mom and back in school full time myself, I also need easy Valentine’s Day treats. These Dipped Wafers fit the bill perfectly! 1. Place a non-stick mat or baking sheet lined with wax paper on your work surface. microwave for 1 minute. Stir and repeat every 30 seconds until fully melted. the wafer on the edge of the glass. 5. Repeat for the remaining wafers, decorating each one after you’ve dipped it. 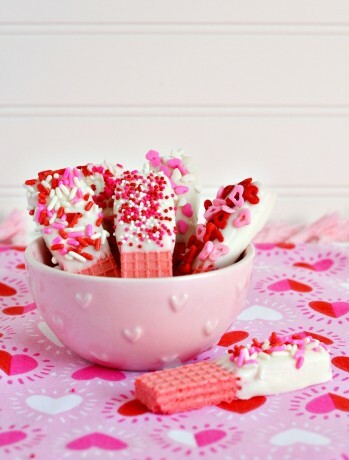 Just like that you have a delicious but easy Valentine’s Day treat that your whole family is sure to love.